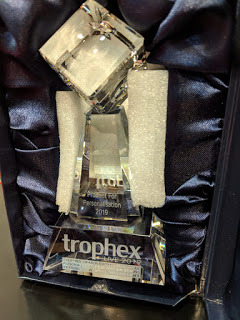 Sagetech Machinery win award for Best Product for Personalisation awarded by Trophex 2019. After establishing Sagetech Machinery in 2016, it comes as no surprise to hear that Sagetech Machinery have won their first award. Presented to them at the Trophex Exhibition, held at Sandown Park in January, the Sagetech Team were awarded Best Product for Personalisation for their Desktop Engraver which was on display and demonstrated at the show. The award which was voted for by attendees at the event came as a huge surprise to the team at Sagetech, who only launched their engraver at the W18 exhibition in October 2018. Commercial Director Sophie Williams exclaims “We are so honored to have received this award. We spent a lot of time and energy in researching our Engraver, to ensure we had a product that filled a gap in the market. There are so many other great products out there for personalization that we didn’t expect to get nominated for the award, let alone win. It’s great to have been acknowledged for the hard work that our team has put in and show that it has all paid off”. The family ran business, Sagetech Machinery are more well known for their British Made, Vertical Panel Saws which are sold around the UK and overseas. In 2018, Managing Director Craig Williams, decided to undertake research to support the production of a new Desktop Engraver that could support the clients of their Vertical Panel Saws who had given him feedback on requiring a product that could utilize their offcuts. Craig continues “I was receiving feedback from clients who owned our Vertical Panel Saws that they were wasting their offcuts and were looking for a machine that could allow them to turn their offcuts into a new revenue stream. After thorough research, we decided on our Desktop Engraver, which allows for a range of materials and sizes to be engraved onto and with exceptional accuracy”. In preparation for attendance at the Trophex Exhibition, the team had prepared various items to show case the potential of the desktop engraver, with its fine detail for cutting, etching and engraving onto a variety of material. They took along a variety of personalised products, made out of different materials, such as MDF, Ply, Bamboo Coasters, Acrylic, glass and metal to mention a few. Obviously, visitors were impressed with the array of items on display and voted in abundance for the Desktop Engraver to win the Best Product for Personalisation Award. With this award leading onto an excellent start to 2019, we are excited to see what else is in store for Sagetech Machinery this year.